Our 100 years of building the industry's best vacuum systems is your assurance that AVC will help you select, design and install the proper industrial vacuum systems. Industrial vacuum systems manufactured by American Vacuum include portable, stationary and custom vacuum systems for industrial use. Industrial explosion proof vacuums include patented H.E.P.A. filters, abiding by both OSHA and NFPA regulations. American Vacuum also has industrial vacuum accessories including vacuum separators, and replacement parts including hoses, vacuum tools and components available for existing systems. Since 1910, American Vacuum Company has been manufacturing a complete line of industrial vacuum cleaners, including industrial flux recovery systems, to meet the ever-growing industrial vacuum industry. For the last 100 years, the Arco Wand brand name has been synonymous with superior performance, reliability, and a quality product made in the USA. With over 500,000 successful installations behind us, American Vacuum is an industry leader and continues to push the industrial vacuum industry forward. Whether it be a small chip collection application or a central vacuum system to clean your entire facility, American Vacuum has the expertise and knowledge to help find you a solution. 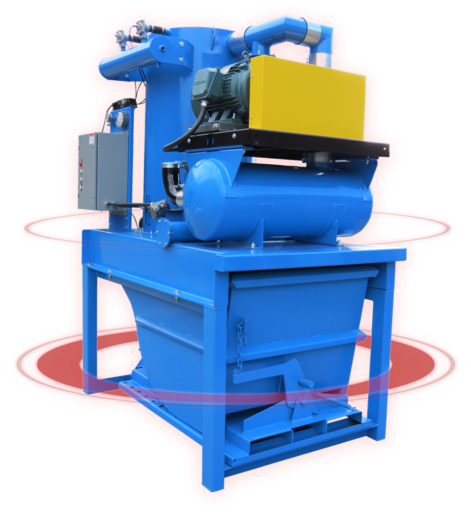 Our systems are capable of vacuuming both wet and dry materials and a variety of material sizes from small dust particles to large metal scraps. Take a look at our case studies to see our extensive capabilities. With our unmatched 90+ years of combined industry experience, our dedicated employees will help you design, build, and install a custom solution that fits your needs. Fill out our Central Vacuum Systems Questionnaire to see if we can help you with your Industrial Vacuum needs! American Vacuum has a complete offering of services. From building Turn-key vacuum systems to repairing a machine that has been in the field for decades, American Vacuum can do it all. We have thousands of replacement parts on hand and contract crews located throughout the country who can assist you with any vacuum issue you may have. American Vacuum carries a complete line of hose and vacuum tools designed to meet every industrial cleaning application. With the industries largest selection of hose and tools, we can ship most from stock at the industries best price. American Vacuum is capable of moving a variety of materials with our vacuum units and central vacuum systems. Because of our vacuum unit’s ability to move many material types, our systems and units are great for many different applications and are used in a wide variety of industries. American Vacuum has been manufacturing Industrial Vacuums including portable, stationary, and central vacuum cleaning systems since 1910. We have installed over 500,000 Industrial Vacuum Systems across the United States and pride ourselves on being a family-owned business. Please take a look at some of the case studies below to learn a little more about how American Vacuum is an industry leader and constantly pushing the industrial vacuum industry forward.